Probably the main perk of being a lodge owner is the opportunity to share our mountain lodge with other like-minded mountain people. 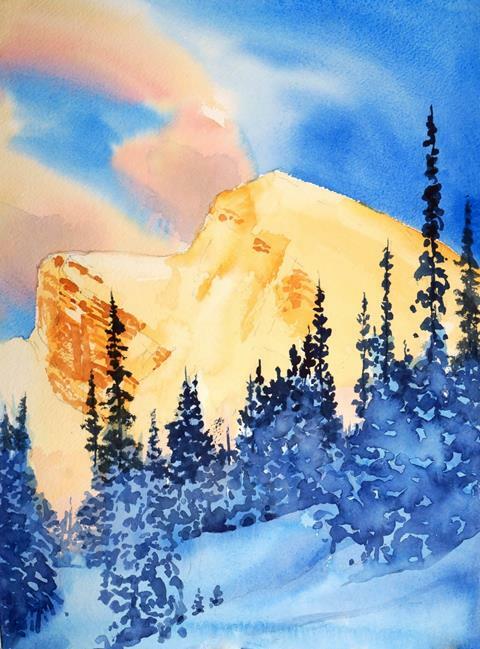 Of course, we are all drawn to the mountains to ski, but many folks also use their time in the mountains as a source of inspiration for their artistic pursuits. Our northern latitude provides us with beautiful lighting at both ends of the day, especially the evening alpenglow. 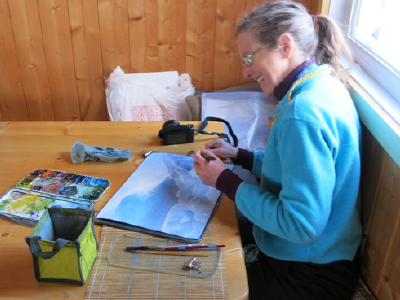 She usually returns to the lodge a couple of hours before the rest of the group so that she has lots of room to spread out her paints and create her paintings. The afternoon light coming in the dining room window is also perfect for painting. I am not very artistic, but I love watching how her paintings evolve. The rough pencil sketches that Suze comes in with, lead to each successive colour getting added in a particular order, and then dried in front of the fire, to create the finished painting. Suze has a loose goal of completing a painting a day, but that often depends on how inspirational the lighting is and of course, how good the skiing is! I have seen her, no doubt in a release of pent up artistic energy after skiing for three days in a row, complete three incredible paintings in one day! On the last evening of their ski week, the group is treated to an exhibit of the week’s paintings. We all enjoy a glass of wine while discussing the paintings, which day and where they were viewed from, and choosing favourites. Suze has generously gifted one of her paintings to Dezaiko Lodge and several guests have purchased paintings of their favourite scenes. My favourite painting from this past season is Alpenglow on Wrex. Wrex is an iconic peak in our operating area. The view is from the lodge area, with the foreground already in shadow and the peak behind kissed by the last of the day’s sun at around 5 pm in February. I try to time my outdoor shower to take in this view. If you’d like to view some of the paintings from last season at Dezaiko, or some of her other beautiful landscape paintings, check out Suze’s website. Winter has arrived! The BLBCA blog let’s you experience lodge life and the BC backcountry from the comfort of home. Get insight on snow conditions, info on backcountry safety or updates from the numerous community events the BLBCA participates at throughout peak season! Check out our recent post from G3 – Genuine Guide Gear focused on what makes or breaks a good backcountry ski experience at Valhalla Mountain Touring. Check back regularly for all of the latest updates and insight. Most recently the BLBCA attended MEC’s Snowfest in Calgary, Alberta on Sunday, November 20th. Executive Director Brad Harrison attended the events and also held an Avalanche Awareness 101 Clinic for those in attendance. 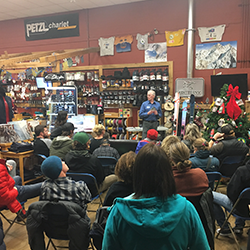 Throughout the month of November the BLBCA and True Outdoors presented Backcountry 101 Clinics at four local True Outdoors locations. The free sessions offered attendees a chance to learn mountain safety from a veteran backcountry professional, as well as see some of the latest in backcountry gear and avalanche safety gear. 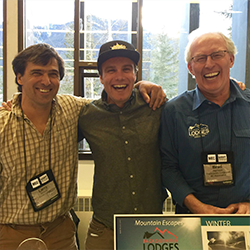 The BLBCA also participated at this year’s Banff Mountain Film Festival. Partnering with True Outdoors, representatives met with festival attendees, discussed the BLBCA and there were even some great prize giveaways Courtesy of True Outdoors. 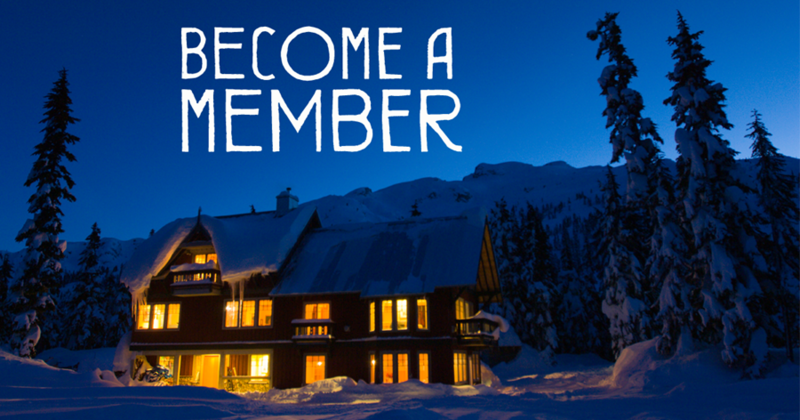 The Backcountry Lodges of British Columbia Association’s members are comprised of a unique group of businesses. 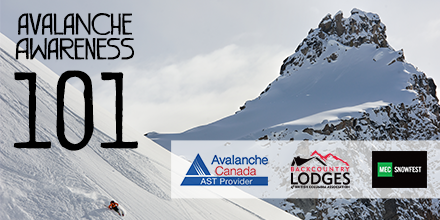 Despite being industry competitors, in 2004 nearly 30 independent backcountry lodge operators united to become the BLBCA. Today the association is comprised of three levels of membership—Full, Associate and Affiliate—allowing members of the local community, aligned to similar backcountry goals, to support and participate in the BLBCA. The Association works together to drive progress in the backcountry industry, in the interest of continually enhancing the service their customers receive. Rock the BLBCA! Bring us on your next adventure into the backcountry! Sign-up today and we’ll send you a BLBCA sticker absolutely FREE. It’s that easy!